Kimpton Hotels & Restaurants has announced plans to open a four-star Kimpton hotel in Toronto’s tony Bloor-Yorkville neighborhood, with a mid-2018 opening date. Owned and developed by InnVest Hotels LP, Kimpton’s new boutique hotel will be the result of a major conversion of the current Holiday Inn Toronto Bloor Yorkville. The revitalized 13-storey property will comprise 189 guestrooms, including 18 suites and one presidential suite, 2,000 sq. 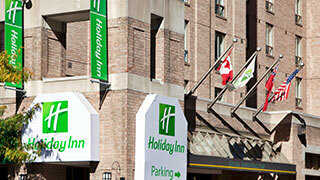 ft. of ground level meeting space and a Bloor St.-facing leased restaurant and bar. Additional amenities will include a fitness centre, complimentary bikes, yoga mats in every room, morning coffee and tea, and nightly social hour.